Home » Uncategorized » Growlerpalooza 2015: Which Travel Growler is Right for You? 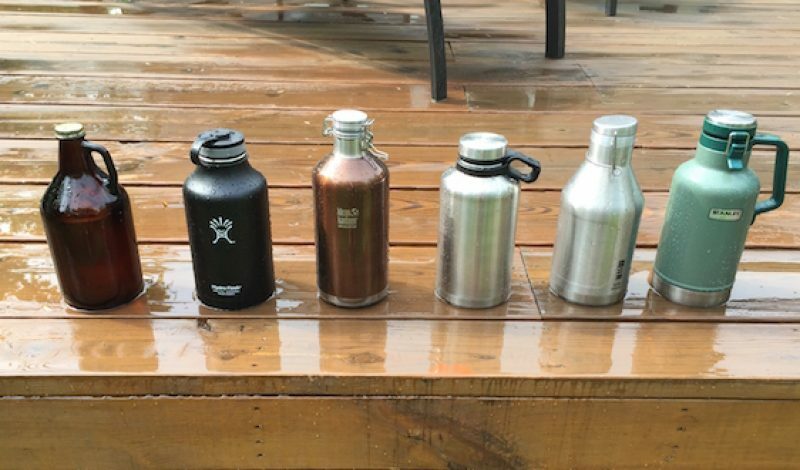 Growlerpalooza 2015: Which Travel Growler is Right for You? 1. Breweries that cannot distribute beer for consumption off premises. 2. Breweries that can distribute beer for consumption, off premises, in approved vessels. 3. Breweries that can distribute beer for consumption off premises. Generally speaking, these aforementioned vessels are widely known as “growlers” and are un-insulated brown glass jugs that are offered in sizes of 32oz or 64oz, and usually come with a universal Government Warning about alcohol consumption printed on them. They are coveted in the craft beer industry as status symbols, with my personally collection currently hovering around forty. That’s a small number compared to some diehards who seem to be saving them for some impending growler crisis. Keep in mind that since they are un-insulated glass, they aren’t designed for long term beer preservation without proper refrigeration and handling. Hydro Flask – and to some extent Klean Kanteen – have been offering “travel growlers” as an alternative to the glass versions for some time. But it has taken until 2015 for us to see a concerted effort by others in the outdoor industry to join the fray. This sudden concern for helping us safeguard our suds while travelling happens to conveniently parallel the boom in growth for the Craft Brew Industry in terms of production, popularity, and availability. Manufacturers of these travel growlers claim that they are well suited for porting our beer around while also keeping it fresh and cold. With so many of these vessels just now hitting the market, we here at Gear Institute decided it was time to put those claims to the test. So, we gathered up several of the containers in question, rounded up some friends, grabbed a keg of tasty craft beer, and spent a grueling 24 hours on our “research.” It is a brutal job, but someone has to do. We affectionately named this experiment “Growlerpalooza 2015,” and it turned into a full day of friends, brews, and good memories that was sponsored by a bunch of great travel growler makers and one awesome brewery. 1. Does the growler keep beer cold and fresh for the amount of time that manufacturer claims? 2. Is the growler leak proof and thus truly portable? 3. How easy is the growler to use (pour, carry, etc.)? All with the intent of guiding you in the right direction when spending your hard earned greenbacks on one of these products. In order to approach our objective scientifically, each growler (variables 1-5) – including the traditional brown glass growler (variable 6) – was filled from the keg (control) and the temperature, amount of carbonation, and taste characteristics was be recorded in six (6) hour intervals over the course of twenty-four (24) hours. These beers would also later be compared to a fresh keg pour. Additionally, in an effort to try to simulate actual travel, each of the growlers was carried, shaken, and dropped randomly to see if there was any type of impact on performance. For the first six hours (6), these vessels were placed in a controlled environment (my kitchen). For the balance of the event, they were left outside in direct and indirect sunlight, to simulate the environments they would be in on any given day, in real time. Each volunteer was assigned a growler to work with throughout the day. By doing this, the user became more familiar with the characteristics of that particular vessel and was able to draw better conclusions over the course of testing. Banded Horn Brewing is a lot like “The Goonies” – a group of rascals looking for fun and adventure. But instead of hunting down “One Eyed Willy” they’re hunting down quality ingredients for their sud samples. Stemming from Biddeford Maine, they focus their efforts on classically styled beers that are scientifically crafted – which make them ultra-desirable. The particular beer used in testing was an unfiltered German pilsner – or Keller Pils – that was kegged on April 30th 2015 – making it super fresh, refreshing and perfect for this experiment. Banded Horn was also kind enough to donate their Cellarman, Bob Bartholomew, for the day to stand as our expert on-hand – sealing the deal and bringing up the level of professionalism for this foray into the unknown. I grew up with Bob and his personality and experience with craft beer was a major benefit. He also provided a vocabulary filled with awesome technical terms and kept the rest of us from raiding the keg as well. No one ever brags how good their warm beer is – mostly because it’s not. Warm beer is horrid, so the temperature of the liquid is key. We found that any time the temperature of the beer rose above 60°F things started to go south. That is when the flavors really break down, the crisp and refreshing body starts to dull, and ultimately the beer goes flat. Out of the five travel growlers tested, Hydro Flask and Miir claimed to keep liquids cold for twenty-four hours, Stanley claimed to keep liquids cold for sixteen hours, and neither Innate nor Klean Kanteen made any claims regarding how cool their vessels could keep liquids at all. By the end of 24 hours, Stanley had taken the gold by being able to keep the Pepperell Pilsner cold – topping out at 56°F. Coming in second was Innate at 58°F and third was Hydro Flask at 59°F. On the flip side, the glass growler rose to a brew-flattening 76.2°F by the end of the test, followed by Klean Kanteen at 63°F. Temperature and Freshness go hand-in-hand, but seeing that we were opening and closing the travel growlers for test samples throughout the day, air and the type of lid used also played a key role in how fresh the beer was after twenty-four hours. In the end, Hydro Flask – with its screw top lid – proved supreme, even though it came in third as far as temperature is concerned. Overall, it allowed the beer to maintain a frothy head, and even though it was a little warmer, the true refreshing taste of the Pepperell Pilsner was still present. Coming in second was MiiR with its flip-top lid, followed by Innate, the only other screw top in the travel growler group – both of which allowed the beer to keep a decent head, didn’t go flat, and provided a nice balanced taste at the end. While getting caught up in all the hubbub of how our sacred Pepperell Pilsner would fare, we almost forgot about how the travel growler actually functioned in actually dispensing the beverage. The proper pour from vessel to glass requires the glass to be tilted slightly, which obviously occupies the use of one hand, leaving you with only one free hand to actually pour the liquid gold. This could potentially be problematic if the growler was heavy and difficult to hold. In this particular category, the Stanley Classic Grower was hands down the winner. It outperformed the competition by leaps and bounds thanks to its flip top lid that opened perpendicular to its oversized handle. This configuration made it almost too easy to pour the next pint, and truly set this jug apart from the rest. The Innate growler followed in second place due to its generous grab handle and lid that conveniently gets out of the way of the pour. Third place actually went to the lowly brown glass growler – again, mostly due to its handle. Both Hydro Flask and Klean Kanteen proved to be a pain in the arse to pour single-handedly and MiiR was a bear for folks with smaller hands – but it was more manageable once you got used to it. Additionally, it should be noted that the MiiR lid is so difficult to use that the company that had to put a sticker on it just to show you how to re-seal it. Judging just how easy or difficult it is to lug these growlers around was a bit difficult, especially considering that we’ve all lashed stuff to – or sacrificed room inside – our packs in order to carry the things we really want and need. That said however, a couple of these growlers stood out when they were broken down into two categories: “packable” and “ease of carry”. The two easiest to pack would have to be the Klean Kanteen Classic Growler and the Miir Vacuum Insulated Growler. Though both are sizable, they have a sleek design that allows them to slide into a pack, satchel, or even a water bottle cage on your bike. (Seriously, people make them for growlers). The third rascal in this bunch would be the Innate Craft Growler, which, even though it has a handle, is one of the smallest growlers in the bunch. In terms of travel growlers that were easy to carry by hand, it came down to a tie between Stanley and Innate – both of which featured excellent handle design. These two could prove to be a real urban delight for those of us living down the street from our favorite watering hole, and are responsible enough to walk to and fro. All of that being said, if we had to be pick a winner in the portability category it would be the Innate growler. We found it easy enough to both pack (and retrieve) and to carry by hand. Though not required in all states, all of the brown glass growlers we collectively owned had the government warning label on them, which was something we had visually confirmed ahead of time. While not a nation-wide requirement in any way, it is a good practice to affix the label, and a good reminder to drink responsibly. Out of all of the travel growlers test, only Stanley and Innate featured this warning engraved into their bottoms. MiiR also had a warning included, but it was on a cardboard card, which you probably wouldn’t carry around with you from brewery to brewery (if you do, you’re a champ!). The needle points in many different directions in regards to how long you can store craft beer in anything other than a factory sealed keg, bottle, or can – but for the sake of this argument, let’s assume you can store beer in one of these growlers for up to a month if it is refrigerated and unopened. Once the seal is cracked however, most growlers are capable of keeping their contents fresh for about three days. While those timeframes can vary somewhat, these were the general numbers that we all agreed on, and anything after that is a gamble. Out of all of the growlers tested, the only one that really couldn’t claim that it had a rock solid “airtight” seal was the Klean Kanteen – mainly due to a dry seal. Once that seal was wet however, it became airtight. Oddly enough, Stanley contacted me to let me know that they had removed the claim that their travel growler was airtight for some reason. We didn’t observe any major concerns in this regard, except for a situation where the growler was laid on its side for an extended period of time. For the most part, I would say that this was a non-issue for both of these containers. Can These Suckers Actually Be Filled At A Brewery? Members of the team was tasked with either visiting or reaching out to a brewery in their area to see if they would actually fill these growlers. In all cases we found that as long as the law allowed for it, these travel growlers posed no issues in being topped off from standard brewery taps, nitro taps, or cask taps. But these were the only taps asked about or tested. We know that there are a variety of other, new-fangled taps out there at some breweries, but based on their limited use we weren’t able to confirm or deny that they would work with our growlers. In my heart of hearts, I believe it’s safe to assume that if a brewery can fill the traditional brown glass growler, they shouldn’t have any issues with any of those used in this test either. When we first branched out to take on this daunting task of standing around and drinking beer all day, we all assumed some clear winners would rise to the top of the list. What we soon found out was that it was situational, and that each of these travel growlers had moments to shine. (Well, except for the brown glass one. That thing is a nightmare). The runt of the bunch – and perhaps the least known too – the Innate 64oz Craft Growler excelled in all areas that we tested, and then some. First and foremost, it kept the Pepperell Pilsner cold and fresh, but it also provided an easy pour, and was a cinch to carry in almost every way. The biggest of the bunch, the Stanley Classic Growler bested its own claims of keeping beer cold and fresh for sixteen hours by actually reaching the 24-hour mark. Excelling in both form and function, it is easy to carry and pour, and boasts the classic “Stanley Vacuum Bottle” look. For one of the first travel growlers on the market, it’s obvious why this product is still around. Its rugged design, and ability to keep beer fresh and cold for an extended period of time, helped the Hydro Flask 64oz Beer Growler earn a spot on this list. The only sticking point is the lid, which gets in the way of the pour from time to time. Obviously there are other travel growlers available on the market, and we’re sure that more are on the way. But we purposely went after products that are readily available now, have classic growler design, and fall within a common price range. The team agreed that this was a good sampling of the current market, with each container having its own strengths and weaknesses that make them perfect for this type of test. Our experiment was conducted on a hot and humid day with the growlers being exposed to both rain and sun. We felt those conditions were most likely a little exaggerated, but by no means extreme. In the end, all of the travel growlers that were tested were better than the traditional brown glass growler that you can get from the brewery, although they were missing the cool custom logo that comes from your favorie local brewery. Additionally, in keeping with Gear Institute tradition, our testing exceeds the typical “does it keep my beer cold and fresh?” that we’re use to seeing elsewhere. Obviously a 150-liter cooler can keep your beer cold and fresh for an extended period of time, but you can’t easily pour from it, nor carry it around with you. In order to provide well-rounded results, we brainstormed different environments that these travel growlers would be used in, how they would be carried, etc. We sincerely hope that this grueling day of sacrifice we made can provide some insight into choosing which growler is right for your particular needs. Gear Institute would like to thank Hydro Flask, Stanley, Innate, Miir, and Klean Kanteen for donating these epic vessels. We would also like to thank Banded Horn Brewing Company for providing Bob and the log of Pepperell Pilsner. It proved to be the perfect beer for the weather and the whole team enjoyed it. We hope to see your beer reach more markets, as it’s better than some of the other swill we’ve been “forced” to drink. Also, special thanks go out to David Wollner, Master Brewer and Owner at Willimantic Brewing Company not only for fielding some questions on legalities, etc – but for striving to continue to provide awesome beer to us folks in Connecticut. Last but not least, a big thanks to the test team – Molly, Nate, Nick, and Bob. You dedicated a day of your lives to help out Gear Institute and helped achieve the goals at hand. Enjoy your travel growlers! *If you want to find out where you state stands on the porting suds click here.